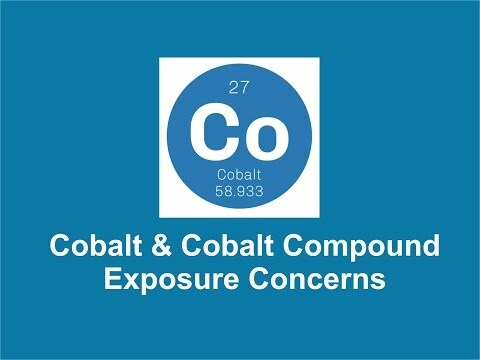 Workers in industries that utilize cobalt and its compounds, and people living near these facilities, could be at risk of exposure to elevated levels of these substances. Last month, the U.S. Department of Health and Human Services released the 14th Report on Carcinogens (RoC). It contained newly reviewed substances that are known or reasonably anticipated to cause cancer in humans. Included in this list was the metallic element cobalt and cobalt compounds that release cobalt ions in vivo. According to the National Toxicology Program (NTP), the interagency program congressionally mandated to prepare the RoC, cobalt and some cobalt compounds are being listed as reasonably anticipated to be carcinogens. California’s Office of Environmental Health Hazard Assessment (OEHHA) already included cobalt metal powder, cobalt [II] oxide, cobalt sulfate and cobalt sulfate heptahydrate in its list of substances known to the state to cause cancer for purposes of Proposition 65. Cobalt is a naturally occurring element that can be present in different forms. It is mixed with other metals to make cemented carbides, bonded diamonds and alloys that can be used to make durable industrial, consumer and military products. Rechargeable batteries, some surgical orthopedic joint implants, and pigments used to make a rich blue color for glass, tiles and ceramics are some of the products made with cobalt. Many green energy products, such as solar panels, car batteries for electric vehicles, and wind and gas turbines, are made with forms of cobalt.